The wind speed sensor needed to be fiddled with so I made two trips to the top of the mast. This used to be a big chore for Kathy as she'd have to manually winch me up which is very exerting. Now we have a powerful electric winch so two trips to the top of the mast is just fun and games. We finally got out for a sail on LightSpeed. We had the good fortune of taking some new friends along Jack, Nichole and Sam of s/v Kitty Hawk and Guillermo Anderson... Honduras’s best-known World Music Artist. Sailing conditions were light at best, but it was a beautiful day to get to know the boat. We also had the chance to run the water maker and put a few gallons in the tank. 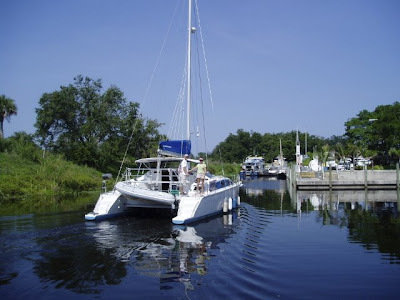 It's a Spectra Catalina 300 and it puts out about 12 gallons an hour which is a luxurious addition to our lifestyle. Guillermo on lookout as we head out of the congested inner harbor near La Ceiba Shipyard, Honduras. Bridge deck clearance. This is the vertical distance measured from the water to the underside of the boats bridge deck. It is also referred to as under wing clearance. At maximum design load we should have 28.5" of clearance and as you can see from the picture this is a clear span with no protuberances. This translates into a capable, fast, quiet and comfortable boat. 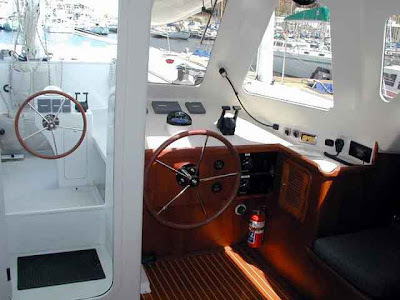 The forward cockpit design has all sail handling controls within easy reach and offers unparalleled safety as the cockpit is waist deep and one is about eight from the edge of the boat. Up swept bows slice through waves. 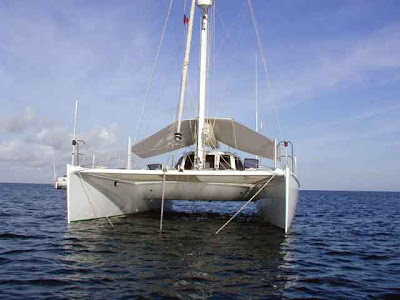 At over twenty two feet wide this boat has a huge amount of initial stability. 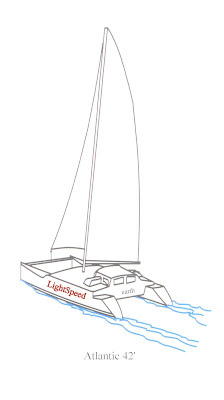 We arrived safely and are getting settled on the new boat s/v LightSpeed located in La Cieba, Honduras. Lots cleaning, organizing and list making going on. Today we are flying to Honduras! Our new to us boat awaits in La Ceiba, but since our flight is late we'll only make it to San Pedro Sula today. The city of San Pedro Sula is one of the big ones in Honduras and so we'll do a little shopping tomorrow before heading to La Cieba. Flights are pretty cheap on www.Spiritair.com so we may make a few trips back to the USA to pick up parts and pieces to get our new boat set up how we like it. Off line for a few days and the USA phone 954-305-2703 will be useless in Honduras, but we may get a local number and if so we'll post it here on the blog. 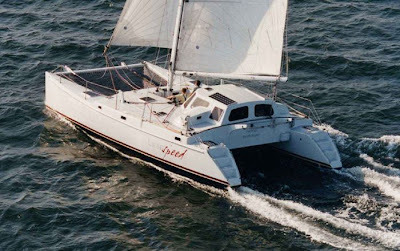 1998 Cruising World Multihull of the year award. Waters of the Okeechobee. Don't you love to say Okeechobee? Waterspout approaches Pacifica on Okeechobee. We crossed paths with a huge thunderstorm about six miles from the edge of the lake. We'd been watching it coming and were tracking it on the radar. The tracking was a little futile as the storm took up half of the screen on 24nm range. .. there was no avoiding this thing! As it approached we spotted a water spout and immediately dropped the anchor in about 10' of water. Kathy was on the foredeck attaching the snubbed as the spout approached as I tired to hold the bow into the wind and screamed at her to forget the snubber and get inside NOW! Winds quickly passed gale speed spindrift and foaming water was blown in heavy streaks and stining rain and hail made visablity maybe 50'. Then the wind picked up even more and approached storm force of 48 knots. I saw a sustained 47 knots before I decided there was no benefit to staying on deck and ducked inside. Lightning was crashing down and visibility nil and I was glad we had six miles of sea room before we'd end up on a beach. There was no way to fight this wind which may have peaked near 60 knots. It was by far the most scary thirty minutes I've spent on a boat as I was positive we'd be hit by lightning and maybe even be blown over! 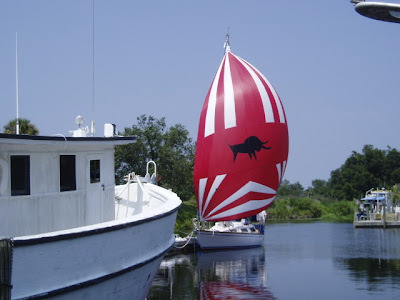 It's pretty ironic that after all our ocean passages I found myself most frightened on Lake Okeechobee! Dark wall of clouds approaches. Fort Myers Beach sunset. Nice to be in USA!! !